Ramadan is the ninth month of the Islamic lunar calendar and the holiest month for Muslims all around the world. The significance of this month is believed to be the revelation of the Quran, the holy book of Muslims, to Prophet Muhammed by Allah. Currently, there are approximately 1.6 billion Muslims preparing for Ramadan. During the month of Ramadan, common questions may arise. Here are a few those questions answered. Ramadan lanterns are displayed for sale at a shop ahead of Ramadan in Cairo, Egypt. Ramadan is determined by the sighting of a new moon since it goes by the Islamic lunar calendar, and because of this, it comes 11 days earlier each year, which means it can begin during any season. A crescent moon, signifying a new lunar month, is a symbol of Ramadan. This one, with Jupiter on the left, shone over Amman, Jordan in 2008. Fasting during Ramadan is one of the Five Pillars of Islam along with, Shahada – the declaration of faith, Salah – prayer, Zakat – giving charity and Hajj – pilgrimage to Mecca, which makes it mandatory. However, the purpose of the fast is to bring faithful closeness to Allah, purify the mind and soul, practice self-restraint, think of the unfortunate and detach from worldly pleasures, along with focusing on prayer. Muslims have to abstain from food and beverage during the fast, amongst smoking, chewing gum and sexual contact during daylight hours. They also have to be cautious of swearing or speaking ill of others, which will result in the fast being inadmissible. The start of the Holy Month Ramadan seen in Istanbul, Turkey. Yes, Muslims wake up before dawn and have a meal called Suhoor. Men line up at a takeaway food stand in the Saudi port of Jeddah in the early hours of August 26, 2011. Practising Muslims eat their suhoor meal before dawn during the holy fasting month of Ramadan. And break their fast at dusk, calling it Iftar. This Sunday, July 6, 2014 file photo, shows an Iraqi family waiting to break their fast during the hold month of Ramadan in Basra, Iraq. The fast lasts for the duration of the month, between 29 and 30 days, depending on the sighting of the new moon. This flock to the Jumeirah Mosque in Dubai, United Arab Emirates, during Ramadan. How many hours a day do Muslims fast for? The number of hours the fast will last throughout the day will vary for Muslims in different latitudes. This year the fast will be the longest in Denmark and shortest in Argentina. No, there are exceptions. The elderly, disabled, ill, children who haven’t hit puberty yet, pregnant, lactating or menstruating women and travellers are exempt. However, travellers and menstruating women do have to make up their fasts on later dates or can compensate by means of monetary funds. Children sit next to food placed for Muslims before the Iftar (breaking of fast) meal, during the holy fasting month of Ramadan in India, at the Jama Masjid (Grand Mosque) in the old quarters of Delhi. What if you accidently eat or drink something? Accidental eating or drinking will not spoil or break your fast, it’s actually common for people cooking to accidently taste the food they’re preparing. Patema Youssef, 22, is Uighur, a largely Muslim ethnic group living in eastern and central Asia. Here, she holds a dish of Xinjiang noodles, to break her fast with, as she poses in her home in Shanghai. What do Muslims eat when they break their fast? Since Muslims come from different ethnic groups and cultures, their meals vary, but it’s mandatory for them to eat halal – permissible according to Muslim law. However, it’s tradition to break the fast with dates. During the monthlong observance of Ramadan, Muslims fast from dawn to sunset. After dark, most will eat dates. Are there significant days during the month of Ramadan to watch for? 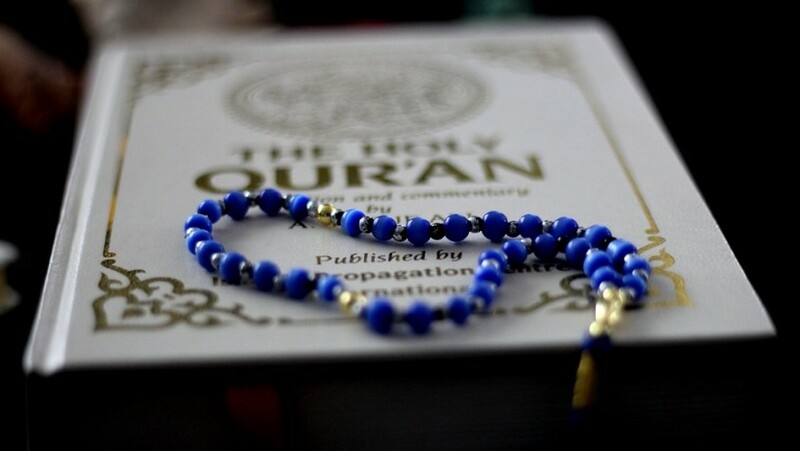 Yes, Laylat al Qadr, or the “Night of Power,” which is commemorated as the night Prophet Muhammad received the first revelation of the Quran, it’s celebrated on an odd numbered day in the last 10 days of the month of Ramadan. Muslims continue to pray and repent throughout the month. One of the oldest known copies of the Quran (8th century), on show at ‘Hajj: Journey to the Heart of Islam,’ displayed at the British Museum in London England. What are Muslims encouraged to do during the month of Ramadan? Read the Quran, pray, give to charity and perform charitable acts. Somali internally-displaced people receive food aid donated by a Qatari charity during Ramadan in Mogadishu. Do you do anything special at the end of Ramadan? Yes, the ending of Ramadan brings forth Eid al Fitr, which translates to the celebration of the breaking of the fast. It starts with a celebration prayer at a mosque followed by visiting friends and family along with indulging delicious foods. Filipino Muslims leave after attending the morning prayers of Eid al-Fitr holiday, marking the end of the holy month of Ramadan, at the Pink Mosque, in southern Philippines. Is there a special greeting for Ramadan? In this Tuesday, Aug. 10, 2010 file photo, a young Palestinian Muslim girl walks in an alley of Jerusalem’s old city holding a traditional Ramadan lantern while celebrating with other children the announcing of the holy month of Ramadan. An Indonesian mother prays while her son plays with a balloon after morning prayers for Eid al Fitr celebrations at the Sunda Kelapa port in Jakarta.